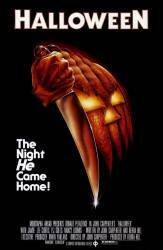 Trivia: Up until The Blair Witch Project (1999), Halloween was the highest grossing independent movie ever made. It was made with a tiny budget of $325,000, but made $47,000,000 at the box office. Trivia: When they were shooting the scenes for the start of the film (all the ones seen from Michael's POV) they couldn't get the 6-year old child actor until the last day so the movie's producer, Debra Hill, volunteered to be Michael for any scenes where his hands come into view. This is why the nails on young Michael's hands look so well manicured and varnished.